The original photograph of this late nineteenth century postcard must date back to the late 1880s. What helps date the picture is that the rebuilding of the main front of Smedley's Hydro was put in hand in 1886. This image was taken after then but an approximate date cannot be gleaned from the postmark on the back. Cards were sold for some years after their intitial publication. To help work out a date we looked carefully at Lime Grove Walk which is the street that goes to the right from just below Bridge House (now the Town Hall). The only building on it is a detached villa that stands a little way down from the junction with St. Joseph's Street and New Street. On the corner of Lime Grove Walk and New Street there is a patch of unoccupied ground. The next image shows building work in progress on this land and we therefore decided on the approximate date for the two cards, as we have an approximate date for one of those properties. The 1880s saw several more churches built on Matlock Bank: they were All Saints', St. Joseph's and Matlock Wesleyan Chapel (now Matlock Methodist and United Reformed Church) and can all be seen in the picture, though you may have to look hard. Schools did not develop at quite the same pace. Some of the churches had schoolrooms but worship was clearly considered to be more important than a decent education at the time. Land on the Bank was also being sold for housing. For example, in 1888 Else and Son offered for sale "a PLOT most eligible and BUILDING LAND, situate near Bank-road, Matlock Bank ... having extensive frontages to two good roads, most admirably situated for the erection of Villa Residence". In the decade between the 1881 census and that of 1891 the population of Matlock, Matlock Bath and District as a whole increased by a little over 1,000 persons. The houses and shops at the southern end of Dale Road (bottom left) were built in the 1880s although the Temperance Hotel (bottom left corner) was of slightly earlier date. "Matlock Bridge". 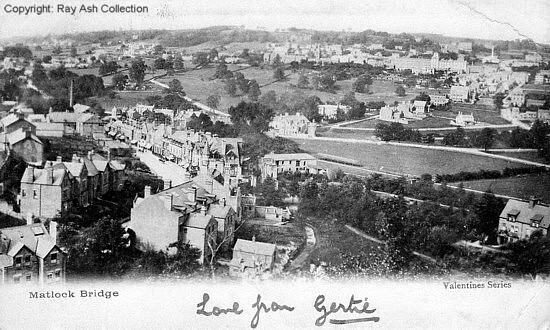 Postcard in the Valentine's series, posted in 1909 in Kimbolton by 'Gertie' and sent to a Miss Nan Crossley of Barnstaple, and the message makes no reference to Matlock. The picture predates the postmark by about 20 years. From the collection of, kindly provided for this website by and © Ray Ash. Written, researched by and © Ann Andrews. Intended for personal use only. By "we", I mean the owner of the card and the webmistress. "Derbyshire Advertiser and Journal", 12 October 1888. Else & Son advertised land on Matlock Bank. See Nineteenth century expansion, population and councils on Matlock & Matlock Bath Miscellany.